Every time someone runs a marathon,metaphorically,they retrace steps taken during one of the most momentous events in World Histoty.It was the Battle of Marathon,led by Miltiades,in 490 BC that took place on the plain of Marathon where a huge force of invading Persians was defeated and the victory ensured the democratic legacy of Western culture. 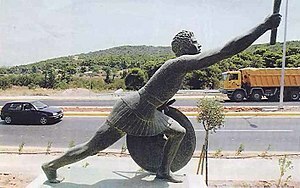 According to legend a messenger named Pheidippides was sent to Athens to bring news of victory.He ran 42 km from the battle field to the capital,announced the joyous message and died.This is the inspiration for the Marathon race we know today,the modern Marathon that commemorates this feat. 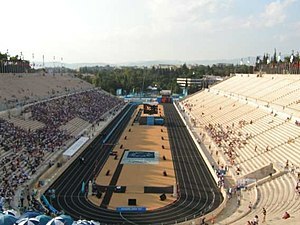 On Sunday November 13, over 20,000 athletes from 96 countries participated in the 29th version of the Athens Classic Marathon,an event that gathers global exposure and significance.Besides the 42 km race in the original course,from the Marathon Tomb to the Panathenaic or Kallimarmaron Stadium in central Athens,the event includes the 5,000 and 10,000 metre races and in addition some other minor competitions. It was a gentle event that inspired with hope the sorely tried Greece. Every long-distance runner in the world should want to run from Marathon to Athens,to relive history and experience the power of the human will . I would also like to make reference to the name of the place Marathonas as most Marathon runners might ignore its connection with the fennel plant.Marathon is the Greek word for fennel and the Marathon town in Attica as well as the surrounding area where the Marathon Battle took place abound with wild fennel. Very stimulating article!i liked very much the reference to the origins of the word marathon but most of all the thing is that the battle in marathon in 490 bc shows the will,strength of mind and courage that are needed for a country to continue its existence! Onomastics,Anthroponomastics,Toponomastics,hypocoristics,diminutive names,nicknames which in the future turned into Surnames (Second Names),bynames and ancestral namesakes that scholars aim to study and explain the origin and the history of countless names all over the world. A very good example is “The American Name Society” founded in 1951 that promotes Onomastics by investigating cultural insights,history and linguistic traits behind the names. Also “The English Place-Name Society” concerned with Toponomastics,the study of Toponyms. I strongly believe in the study and practice of those sciences. Thanks for your comments Dr.Lucas. I like that piece of information about the fennel! Still alive and kicking and posting your interesting travel experiences? However,I can take the alternative of going on without leaving replies or comments.Still,it can tickle my fancy. Anyway,thanks for coming by out of the blue and for liking my ‘fennel’ elucidation. Thank you Lady D for coming by and commenting. Delighted you liked the concept of the post and the historical references to our culture and our strong institutions. I got the copy of the dissertation as well as all the related material. Hope you easily cope with freezing weather. I visited your related post which was tottaly stimulating. Rich historical details in reference to the Battle of Marathon and not only that. Indeed,one of most crucial battles in the history of the West. Thanks kindly for coming by.